Why is Subaru so involved in the Super GT motorsport racing series around the globe? It may have something to do with the new 2014 BRZ tS. Subaru has been highly involved in racing around the globe, and like most automakers who are serious about performance, it’s a necessity. Subaru learns everything about what needs to go into making a successful street performance car from their BRZ GT300 race car. Subaru just finished third overall in the Asian Le Mans Series that took place at Fuji Motor Speedway last month, and although they would prefer to win, the information they learn is invaluable. It will transfer directly to the cars we drive on the street and is what makes the the new 2014 BRZ tS such a dynamic sports car. The BRZ tS will launch soon in Japan and will be a forerunner of a future BRZ STI that will be coming later around the globe. Until that high-performance model arrives, we can see what Subaru’s plans are for the chassis upgrades. Those enhancements are a direst result of what the GT300 race team learns from the GT300 race car. It will come with a number of upgrades that transfer directly to better driving performance for the BRZ tS. The handling and driving dynamics will be improved by STI who manages motorsport activities for Subaru. STI will add goodies that will improve performance to the 2014 BRZ tS by tuning the chassis with large-diameter driveshaft and STI's suspension upgrades that will improve handling performance. The new tS should have improved handling in the corners with the addition of upgrades like a new STI rear suspension link with pillow ball bush, STI tuned strut and coil springs for front suspension and STI tuned damper and STI coil springs for the rear suspension. Stopping ability will be improved with the addition of 17-inch Brembo performance ventilated disc brakes that can be seen with the STI logo. Larger 18-inch aluminum wheels wrapped in 225/40ZR18 Michelin Pilot Super Sport tires will give the new tS a more commanding appearance. tS will also feature exclusively-tuned VDC (Vehicle Dynamics Control) for extra stability. Subaru is still working on engine upgrades for the BRZ STI, and for now we’ll have to settle for STI’s chassis upgrades that will come on the new BRZ tS. But it gives us a good idea of how committed Subaru is to the STI performance brand, STI. 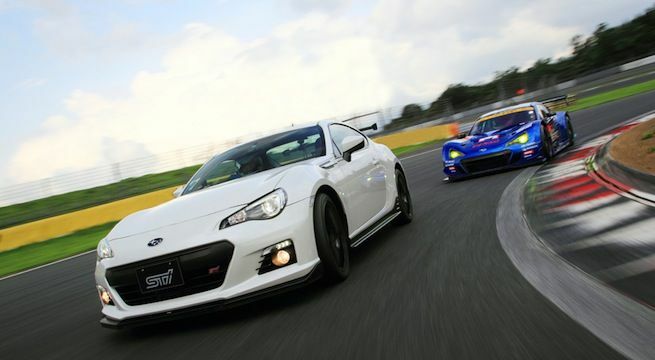 Look for the new 2014 Subaru BRZ tS to launch in Japan before the new BRZ STI is unveiled sometime later next year. Stay tuned to Torque News for the latest BRZ news and updates.